What Day Of The Week Is July 2? 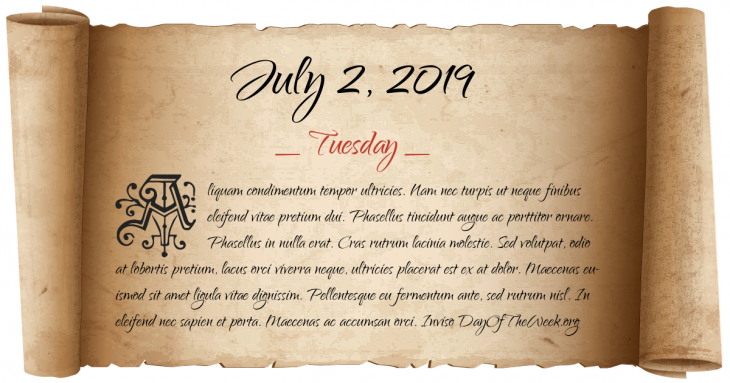 July 2, 2019 is the 183rd day of the year 2019 in the Gregorian calendar. There are 182 days remaining until the end of the year. The day of the week is Tuesday. This day is the midpoint of a common year because there are 182 days before and 182 days after (median of the year) in common years, and 183 before and 182 after in leap years. The exact time in the middle of the year is at noon, or 12:00 p.m. In the UK and other countries that use “Summer Time” the actual exact time of the mid point in a common year is at 1:00 p.m. this is when 182 days and 12 hours have elapsed and there are 182 days and 12 hours remaining. This is due to Summer Time having advanced the time by one hour. It falls on the same day of the week as New Year’s Day in common years. In China, Emperor Zhongzong of Tang inters the bodies of relatives in the Qianling Mausoleum, located on Mount Liang outside Chang'an. Battle of Yamazaki: Toyotomi Hideyoshi defeats Akechi Mitsuhide. English Civil War: Battle of Marston Moor. Thomas Savery patents the first steam engine. Bahia Independence Day: the end of Portuguese rule in Brazil, with the final defeat of the Portuguese crown loyalists in the province of Bahia. Charles J. Guiteau shoots and fatally wounds U.S. President James Garfield, who eventually dies from an infection on September 19. The first Zeppelin flight takes place on Lake Constance near Friedrichshafen, Germany. The East St. Louis Riots end. The Golden Pavilion at Kinkaku-ji in Kyoto, Japan burns down. 37 participants in an Alevi cultural and literary festival are killed when a mob of demonstrators set fire to their hotel in Sivas during a violent protest. Who were born on July 2?